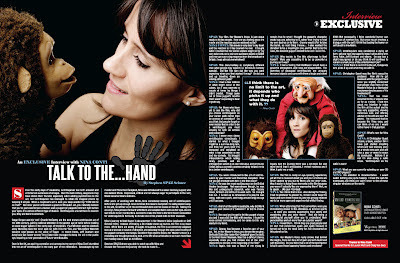 Discussions Magazine Music Blog: An EXCLUSIVE Interview with NINA CONTI! An EXCLUSIVE Interview with NINA CONTI! Since the early days of vaudeville, ventriloquism has both amazed and entertained audiences of all ages. Over the last century, magicians may have stolen their thunder, especially when adding pyrotechnics to the act, but ventriloquism has managed to retain its magical charm by keeping it simple. When a magician’s act is over, you keep wondering: “HOW did he do that?” But once you’ve witnessed a good ventriloquist act, you naturally believe that you’ve just experienced a human and a puppet (or puppets) interact right before your eyes. It’s a whole different type of illusion. Ventriloquists are not there to deceive you, they are there to entertain. Edgar Bergen and his ‘doll’, Charlie McCarthy are the best known ventriloquist act of the 20th century, gaining national attention in the golden age of radio before making an even bigger splash in the early days of television. Paul Winchell and his sidekick Jerry Mahoney took the torch and ran with it in the ‘50s and ‘60s before Winchell became best known as the voice of Tigger. In recent times, Jeff Dunham and America’s Got Talent winner Terry Fator have managed to keep the art in the public eye, inspiring a new generation of future ventriloquists. Over in the UK, an aspiring comedian and actress by the name of Nina Conti stumbled into the art of ventriloquism in the early part of the millennium. Encouraged by her mentor and friend Ken Campbell, Nina was introduced to a small monkey puppet, who she dubbed Monk. Depressed, critical and not always eager to participate in the ‘act’, Monk became Nina’s sidekick. After years of working with Monk, Nina considered bowing out of ventriloquism. Before she got up enough nerve to break the news to Campbell, he sadly passed away. In his will, he left her all of his ventriloquist dolls and his books on the art. Taking this as a sign, Nina pressed forward with Monk and adopted Ken’s dolls as her own. As one last tribute to her mentor, Nina decided to make the trek to the Vent Haven Convention for ventriloquists in Kentucky to donate one of his prized dolls to their museum. Nina’s journey to Vent Haven is documented in Her Master’s Voice (available on DVD October 16th). Instead of it being a 60 minute stand up routine, the film is so much more. While there are plenty of laughs throughout, the film is an extremely poignant look at a woman in search of direction and meaning through the eyes (and mouths) of the puppet company she keeps. Excellent from start to finish, Her Master’s Voice is a revealing and thought provoking look at the life of an artist who is so much more than her monkey would lead us to believe. SPAZ: Your film, Her Master’s Voice, is just about ready to hit the streets. How are you feeling about the movie and the reaction you’ve received so far? NINA CONTI: The movie is very dear to my heart and the reaction to it has bowled me over. I thought when I started that the whole venture might be for my own sake only, so to win and audience award at SXSW and then get such a big response from the broadcast in Britain, I was almost overwhelmed! SPAZ: This documentary is completely different than what people may expect (i.e. 60 minute comedy special). Did the film turn out the way you were expecting when you first started filming? Or did you end up traveling down an entirely different path? NINA: I had a few notions of what might occur at the outset, but I was swerved a couple of times by things I didn’t predict. Things came out of those puppet’s mouths that I wasn’t expecting to hear myself say. SPAZ: For those who have yet to see the film, why did you choose ventriloquism as your career path rather than an actress or comedian? Do you think that people forget or even realize that in order to be a ventriloquist, you must actually be both an actress and comedian? NINA: I never even chose ventriloquism consciously, I started for what I thought might be a summer-long lark, and then ten years later I’m bemused and delighted at what it has unearthed in me and my comedy. Its brought independence which acting rarely provides, and an introspection which is at one ridiculous and profound. I think being a comedic actress certainly helped me to be a better ventriloquist. SPAZ: You were introduced to the art of ventriloquism by your mentor and friend Ken Campbell. How did you get involved with him in the first place? NINA: He was the most exciting man on the British theatre landscape. Not mainstream though, he was like and underground maverick, who was fiercely clever, brilliant and difficult to work with. So I sought him out. I turned up to rehearsals of a play he was doing, with out a part, and hung around long enough until I got one. SPAZ: And of all the options available, why did Monk become your choice of a ‘sidekick’? Or did he choose you? NINA: Ken said you’ve got to let the puppet choose you and it was a bit like that with monkey. I found his voice almost immediately, and he came to life very easily in my hand. SPAZ: Granny has become a favorite part of your act. Yet, in Her Master’s Voice, you donate the original, Gertrude Stein (the name Ken Campbell gave the doll), to the Vent Haven Museum. Was this a difficult choice, especially since you had chosen one of the other characters to donate at the beginning of the film? NINA: Again, this was a result of me trying to remain true to what I thought the puppet’s character would say and adhering to it, rather than trying to foist my own desires on to them. Granny would offer to take the bullet, so next thing I knew… I also wanted the donation to be a meaningful one, and for that to be the case, the donated puppet needed to be one I cared for. SPAZ: Why decide to film this pilgrimage to Vent Haven? Were you expecting it to be as powerful a journey as it was? NINA: I had a feeling that Venthaven would have a powerful atmosphere, and I was not disappointed. The dummies of deceased ventriloquists are uniquely bereaved objects and carry with them a tragic and silent legacy. And the journey there was a lot more fun and more weird than I anticipated, I invited madness and I think it paid me a visit. NINA: Yes I think that is true. Also during the filming, I had no producer to answer to, I knew I could keep the tapes and burn them if need be, and this privacy enabled me to be more open and experimental whilst filming. SPAZ: When attending that first convention, were you immediately drawn to the attendees as kindred spirits … or were you secretly questioning their sanity and wondering why you were there? And did being a ventriloquist yourself allow you to understand their personalities and art more than an outsider would? NINA: I loved them. I think they are great people and I’ll visit that convention again and again because it turned out to be the most batty fun I’ve discovered on this planet so far. SPAZ: Her Master’s Voice really shows that behind the laughs, there can be a lot of pain and self-doubt and self-discovery. Do you think that a lot of the best humor is built upon these opposing factors and emotions? NINA: Not necessarily, I think wonderful humor can come out of nowhere too. But since my art involves a dialogue with the self, I think that basing the humor on self doubt is inevitable. SPAZ: Ventriloquism was considered a dying art form, yet you have managed to keep it alive along with Terry Fator, Jeff Dunham and others. Do you see a slight resurgence or do you think it will continue to remain a small piece of the entertainment pie? NINA: I think there is no limit to the art, it depends who picks it up and what they do with it. SPAZ: Christopher Guest was the film’s executive producer. How did he get involved with the project? And were you slightly concerned that people may think of Her Master’s Voice as a fabricated mockumentary because of his involvement? NINA: That has never occurred to me, or anyone else as far as I know. I told him about my intention to make the film at the outset and he was very supportive, viewing numerous cuts and offering advise on the edit and over the phone. I’m honoured that he became the films exec, and can think of no one I would rather have in that position. SPAZ: What’s next for Nina Conti? NINA: A Christopher Guest sitcom, a book, another film I have just started directing which will take monkey and I on a whole new path and will take a year or more to reach its conclusion. Believe it or not I’m also doing a radio show. Ventriloquism on the radio is back! NINA: I’m addicted to documentaries. I would watch nothing else quite happily. I trawl the web for downloads and DVDs and seem never to tire of these singular windows on the world.